There are tons of options to customize the perfect cup for you. From size to color and length, you can create the perfect fit for your unique body. It’s one of the softest menstrual cups on the market. The MeLuna is incredibly comfortable to wear, with a different model for different activities. The MeLuna Company has been around for a while and has an excellent customer service track record. The MeLuna Sport gets exceptionally high marks from reviewers. Some women will have trouble finding a cup that works for them, despite the multitude of options available. It can stain easily if not cleaned continuously and sterilized according to the company’s instructions. It can absorb odors due to the material used in its construction. The MeLuna menstrual cup is undoubtedly worth a look for most women. Whether you’ve already mastered the art of adequately inserting a cup, or you’re brand new to it, there’s a model for you. Everything is highly customizable, and you can create the perfect fit for your body. It’s made with a very safe material that will never interact with the skin through normal usage. While it’s one of the safest on the market, it does come with a few drawbacks. The MeLuna tends to stain over time and may absorb odors. The best way to minimize this is to follow the cleaning instructions correctly and frequently. Just emptying the cup during menstruation will lead to excessive odors and stains, and greatly reduce the lifespan of the cup. At three years, this product will last you awhile. That’s three years’ worth of tampons or pads that you won’t have to buy. On top of that, it’s much friendlier to the Earth. It greatly reduces waste during its lifespan and saves you plenty of money. That alone should be more than enough reason to give it a shot and see if it’s for you. The MeLuna Company has been around for a long time and has a proven track record. They’re highly regarded in Europe and have finally made their way to the U.S. More than enough research and experience has gone into this product to call it one of the best that you can buy. The website has plenty of additional information on making the right choice for your body and experience level. Check MeLuna out today and get a feel for what they have to offer. This is a high-quality product at a very reasonable pricing point for consumers. This MeLuna Menstrual Cup Review will look at all details and specifications of the product. It will also consider reviews by real women who have given it a shot. This product is made with TPE, rather than silicone like most other offerings on the market. The reason for this is stated as being able to offer a high-quality product at a lower price. There has been much testing and research put into this cup, so the end product is something worth checking out. The company has been a mainstay in Europe for many years. It’s only now finding its way to the United States and is just growing in popularity. 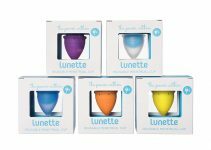 The MeLuna menstrual cup comes in a whole host of different sizes and option. You can customize everything from the overall length to the diameter, and even the size and shape of the stem. It’s incredibly easy to find the perfect fit for your body, although some women may see that the right fit just doesn’t exist. Overall age, activity level, and cervix length and position have all been taken into account for each design. With each offering geared toward a different type of woman, it’s easy to figure out which one will work for you and why. There are also different firmness levels that you can pick and choose from. With the firmest being for physical activities and the softest being for women who have already mastered menstrual cup usage, there’s really no way to go wrong. It’s created for many different body types and lifestyles. The MeLuna Menstrual Cup lasts up to three years without having to be replaced. The material that the cup is made of is not only safe and tested, but FDA approved. It’s effortless to disinfect and clean. Many customizable options make getting the perfect fit very easy. Customers can choose from eight different sizes, nine different colors, three variations of firmness, three different lengths and three different handles to construct the perfect cup for their body. MeLuna offers the most options when compared with all other cups on the market. Not only can you choose your size and stem, but you can also customize the firmness of your cup. Each one you purchase will come with a carrying pouch for storage. Standard Meluna menstrual cups come in small, medium, large and XL. The volumes range from 23ml to 42ml, and the length varies from 45mm to 56mm. MeLuna Shorty cups also come in small, medium, large and XL. The volumes range from 8ml to 16ml, and length varies from 35mm to 44mm. MeLuna Classic has a firmness that’s equal to most silicone cups. It’s recommended for most women. MeLuna Sport offers the highest level of firmness. It’s recommended for active women who participate in sports and physical activities. The firmness provides superior suction throughout muscle contraction and movement. MeLuna Soft is the lowest option for firmness. It’s recommended for women who already know how to use a menstrual cup, due to its flimsiness and lack of ease when inserting or removing. The stem style handle is recommended for women with a high or long cervix. It offers a better grip when removing the cup. 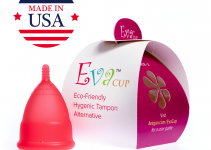 The ring style handle is recommended for women who are new to the world of menstrual cups. The wider material offers an easy way of inserting and removing it. The ball style handle is the most popular offering. It’s made from solid material and is rounded for comfort. The basic model can be made available upon request and comes with no grip. The Meluna menstrual cup comes in nine different colors including violet, red, clear, green, orange, black, blue, red glitter and blue glitter. Wet the cup in 30-40˚C water for 5 seconds. Use at least ¼ tsp of Cetaphil and rub the cup for at least 30 seconds. Use the provided MeLuna brush to clean the two air holes. Rinse the cup clean in 30-40˚C water for at least 30 seconds. The Meluna cup should never be stored in an airtight container as this promotes odors. Each cup should be stored in its own provided storage bag. The MeLuna Company is based out of Germany and has been in the European market for many years. It has just recently received patent permissions to sell in the United States. It also sells massagers and family planning products. It’s known for selling high-quality products at affordable prices. Feedback for the MeLuna menstrual cup is overwhelmingly positive. Customers report that they can’t feel the cup at all once it’s inserted properly. Even women who have only just learned about the company and its offerings have high praise. Most women vow to remain a customer of the MeLuna Company for the rest of their lives. The MeLuna is made of TPE or Thermoplastic Elastomer. It’s non-allergenic, latex-free and contains no toxic chemicals. It will never react with the skin through regular contact. The cup may stain over time. This is in no way indicative of a defective cup. It can still be used frequently. Staining can be kept to a minimum with regular emptying and cleaning. Can I wear it if I’m a virgin? All women can wear the Meluna cup. Keep in mind that it may break your hymen during insertion. The Meluna cup has been thoroughly tested and shows to last for three years. If you notice excessive staining or leakage, it should be replaced right away. The cup can be worn for up to 12 hours or overnight. How often it needs to be emptied depends on your flow. Can it be worn during physical activities? Yes, it can. The MeLuna Sport is explicitly made for sports and physical activities. It’s firmer than the other models and promotes suction during movement.